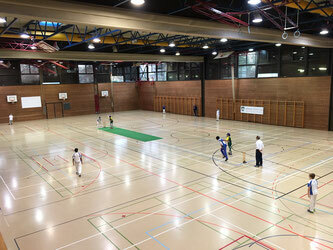 Ian Coltart reports on the Gingins Cricket Club U13 Indoor touranment at the College Madame De Staël in Carouge (GE). 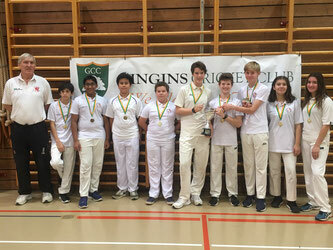 The Gingins U13 Indoor Cricket Tournament was held over the weekend 18/19 November at the Collège Madame de Staël in Carouge (GE). 54 players from seven clubs took part, six from Switzerland and one from Luxembourg. The priority for this tournament was that all players could play four matches over the weekend, so we decided to have six teams of 9 players, playing in two pools (including a combined Basel/GRYCC team). The teams were Basel/GRYCC, Cossonay, Gingins, La Chat, Luxembourg and Zurich. Matches consisted of 15 overs per side. It was encouraging to see players who were new to cricket taking part and gaining their first experience of competitive cricket, alongside the more accomplished cricketers. It is important for the development of cricket in Switzerland that new players are introduced to the game, and can be included in tournaments such as this, to enhance their understanding of the game and to develop their skills in a supportive environment. The skill level was generally high across all disciplines, and the teams played fair and hard. Captains should be congratulated on the way they organized their teams and led by example. Several of the matches had close finishes, including one drawn match between Zurich and Basel/GRYCC and the final in which Luxembourg beat La Chat by 1 wicket! This made for great spectator viewing from the gallery! Best bowler: Luca Swann (La Chat) 6 wickets for 66 runs. Best batsman: Jai Sharma (Cossonay): 84 from 65 balls. Best fielder: Charlie Grimes (Basel): 3ROs, 3 catches (including 1 C&B). Honourable mentions for Kai Salama (La Chat) 3ROs, 3 catches, 1 stumping and Nicky Harding (Gingins U11) 3 ROs and 1 catch. Spirit of cricket (chosen for a “special moment”): Oscar McRae (Luxembourg) for his hat-trick and 4 wickets in 5 balls. Huge thanks to all the coaches, umpires and scorers who helped keep the tournament on track and to schedule. Also to the parents who prepared food and drinks for the players and spectators. Special thanks to Michael Hall for organizing the scoring of the matches and for producing the match statistics. Basel/GRYCC vs. Cossonay Basel/GRYCC won by 4 wickets Bowling: Charlie G 1-14 (Basel/GRYCC). Thomas G 2-8, Ryan S 1-27 (Cossonay). Gingins vs. La Chat La Chat won by 8 wickets Bowling: Luca 2-19, Louis 1-9 (La Chat). Will 1-19 (Gingins). Zurich vs. Basel/GRYCC Match tied Bowling: Connor W 2-17, Charlie G 1-15 (Basel/GRYCC). Roshan 1-7, Ben 1-17 (Zurich).